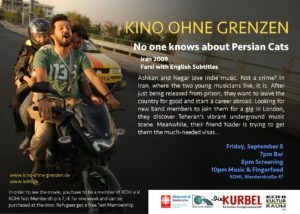 Here is the Iran you don’t see in the news bulletins: it’s the Iran that loves rock, heavy metal and rap. Iran is a nation where most forms of pop music have been strictly banned by the government, but that doesn’t stop people from playing the music they love in secret. They play anywhere: from cellars to cow sheds and construction sites. Negar and Ashkan are part of Teheran’s vibrant and varied underground music scene. Just released from prison and fed up with being hindered from expressing themselves, the two young musicians try to get documents to leave the country for Europe. They have been able to arrange a gig in London, and are searching for like-minded musicians to join them when they meet Nader, a fast-talking black-market businessman who offers to help them. While Negar and Ashkan arrange for a last concert for friends and family in Teheran, Nader is trying to get them the much-needed passports and visas in time. 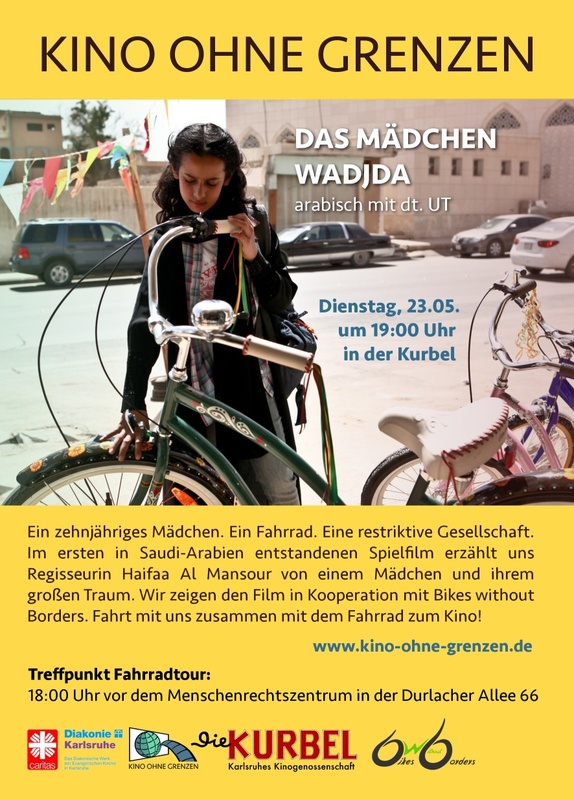 “Wadjda” is the first feature film ever produced in Saudi-Arabia. 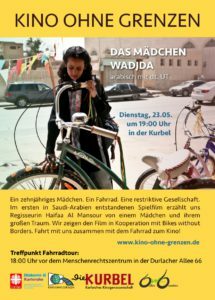 The movie is about Wadjda and her dream to own a bicycle. More about the film. Entrance fee: 50 Cents for refugees, 5,-€ for locals. Join us for a bike tour to the cinema! Let’s meet up with Bikes without Borders – Fahrräder für Flüchtlinge at “Menschenrechtszentrum”, Durlacher Allee 66 at 6pm. 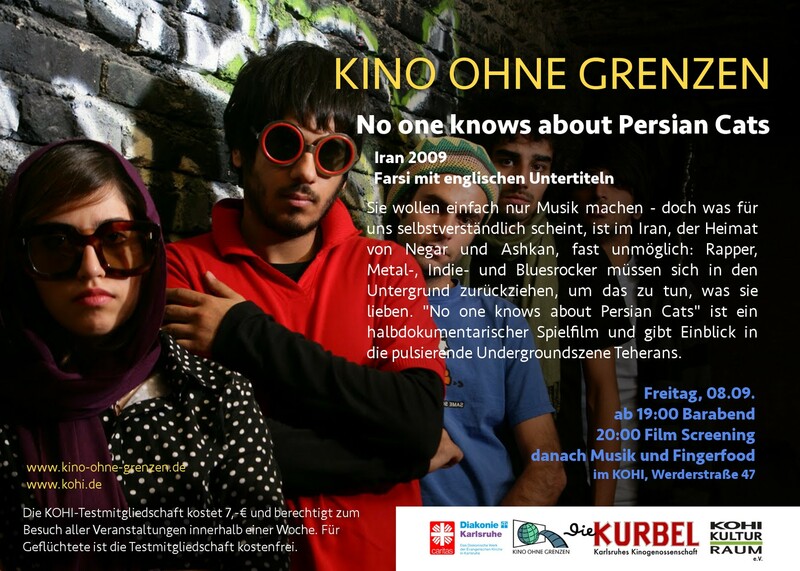 The screening will then take place as usual at 7pm at “die Kurbel” (Kaiserpassage 6). Finally we are also slowly but steady rousing from hibernation and, behold, a true highlight is just around the corner. 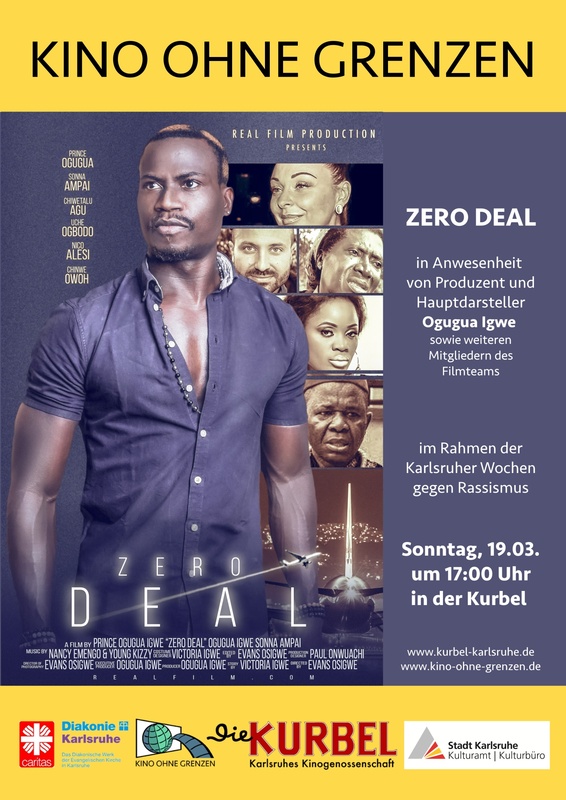 On March, 19th, at 5 pm we are going to show the movie “Zero Deal” – the feature film debut of the author, actor and producer Ogugua Igwe. Every visitor can not only convince himself of the cinematic master piece, but also everyone has the opportunity to address his questions and ideas directly to the producer himself. 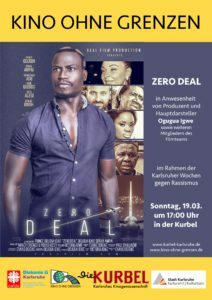 Fortunately we were able to persuade Ogugua Igwe to join us at the screening on March 19th and he will be happy to answer all the questions. To get a brief insight into our work, some impressions from our EPIC FILM PICK event were added to our gallery. In advance of the event we invited in cooperation with COLA TAXI OKAY into their facility including the appeal for everyone to bring their favorite movies or some interesting recommendations. In doing so we wanted to receive a new impression in which environment movies are generally watched in the different home countries and secondly what movies are very famous there. So it was in the end a long series of trailers to rank and rate the various movies. We want to thank everyone, who came and joined us this evening and we hope to bring one or more of the movies on the screen at some point. The new year 2017 is now almost two month old and at this point it’s most of the times worth to look back. The year 2016 was also the first 12 month of CINEMA WITHOUT BORDERS with lots of ups and some downs or better said some new, informative experiences. At the beginning of the year everyone in our team was very suprised, but also pleased about the high attendance at our first events. This idea did obviously not only fascinate us, but as well several other like-minded people in Karlsruhe and the camps. Based on the throughout positive feedback we set the goal to expand our project or at least make it to an established monthly cultural event. To reach new potential visitors you have to break sometimes new ground. Therefore we tried in February with the movie “Caramel” to organize an evening only for women playing with the thought to create an environment for women in the camps, which will motivate them to join our events and equalize our heavily maled dominated visitor numbers. At this point we also want to apologize if there were some misunderstanding or even discontent about our decision. During summer time we decided to bring our project and the European Football Champoinship together by presenting one match at the cinema instead of a movie. Even though some people still might have some troubles with every aspect of the game, football is an universal language connecting people with different minds or diversed origins, which could be also seen at our event. Moreover we had our first screening “on the road” at the Eckkulturdörfle showing some short movies at the evening outside in the open air. Thanks again for the invitation and the possibility to make our project better known. Due to the transfer of a high number of residents into surrounding camps, the demand for living space in the camps declined, so that the situation in the camps in Karlsruhe was changing gradually noticeable by a reduced number of residents or even full closures of some camps. This changing situation was also detectable by the lower numbers of visitors at our events each month. But for us it’s definitely not a bad signal, on the contrary it’s an even higher motivation for us to adapt our project to the new conditions. The autumn respectively the October was packed with the planning and organization for a very exciting event, in particular the Halloween Double-Feature. Thanks to the enormous aid and cooperation from Cola Taxi Okay we could set up an interesting evening in a vampire theme. Beginning with the astonishing Persian movie “A girl walks home alone”, the evening entered slowly but with very impressive black and white images the vampire world. Followed by the New Zealand vampire-comedy “What we do in the shadows” it reached its cinemastic climax. Surrounded by some nice music and amazing decoration we talked and danced together until the morning dawn before we all had to get back into the mortal world. The entire evening was a lot of fun for everyone in our team especially the unproblematic intercultural exchange late in the night. The first year of Cinema without borders came to an end shortly before Christmas season with the German comedy “Soulkitchen” by Fatih Akin. We want to say thank you to everyone, who supported us in our first year in whatever manner as well as to everyone, who attended one of our evenings. Due to new granted support by the Monsignore-Ohlhäuser-Stiftung we will be able to provide this year an attractive, highly varied programm again. So just stay tuned and be surprised what you are going to experience with Cinema without borders this year! First, we wish all of you a very happy new year 2017! May joy, hope and solidarity make this year a better one than the last. Second, we have good news already: The Monsignore-Ohlhäuser Foundation grants us with support for one more year of monthly movie nights for refugees and locals! So, after a quiet holiday between the years, we now continue our work at Cinema without Borders and will soon let you know about our next movies coming up. Well, it’s true. Unfortunately we have to face it again. This year is coming to an end though it feels like yesterday when we just cleaned up after the laste New Year’s Eve party or we finally managed to recover from this night. This year was also a very special one for “Cinema without borders”, that’s why we want to invite every regular guest, supporter, friend, like-minded people, fellow companion and everyone who is interested in movies to our final session on 15th December at 7pm at the Kurbel. We would be very happy seeing a lot of familiar faces of people who supported us during our exciting first year. 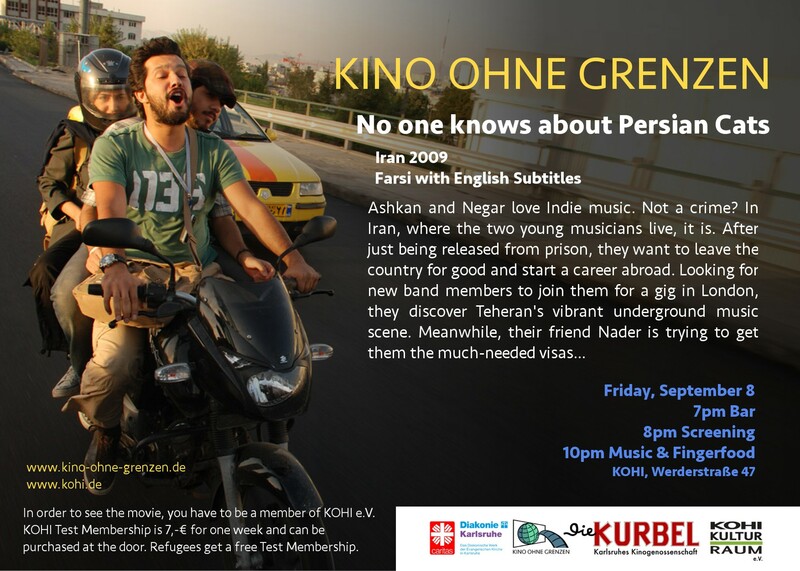 It will be shown Fatih Akin’s tribute to the city Hamburg – “Soul Kitchen” in German and with English subtitles. “Soul Kitchen” is telling the story of a greek chip shop in one of the hoods in Hamburg, which has to discover new ways to survive its financial critical situation to prevent being replaced by a modern real estate project. On top of this the owner named Zino has also to deal with his brother being recently released from prison. A story which sounds like one of the typical dramatic ones, however Fatih Akin managed by adding a mixture of local colour and simple humour to create a movie representing the awareness of life from different cultures.